Denise Cerreta at her restaurant. Photo by Reuben Cox. That stranger’s impulsive act of kindness made a lasting impression on Cerreta. Forty years later, at age 47, she’s on a similar mission. As founder of One World Everybody Eats, a pay-what-you-want restaurant in Salt Lake City, Utah, Cerreta is determined to change the way restaurants do business and to bring delicious, healthful food to everyone, even those who can’t pay. Although skeptics told her that a restaurant based on customer donations could never survive (“These are liberals playing games with the reality known as life,” said Rush Limbaugh of the eatery), the enterprise is debt-free and will have its sixth anniversary in June. Located in a converted two-story red brick building not far from the University of Utah, One World Everybody Eats serves organic, freshly prepared dishes, buffet style, in four cozy dining areas decorated with bright hangings and hand-carved statues from India. The menu changes every day and includes options that impress even the most sophisticated eaters. A hand-lettered notice asks customers to “donate a fair, respectable amount” similar to what they’d pay in other restaurants. Anyone too strapped to make even the most minimal payment can volunteer to wash dishes, cut vegetables, clean up or garden (one hour = one meal), and rice and dal are always free. Since the recession took hold, the number of customers earning meals through volunteering has doubled, but the average donation has remained at a steady $8 to $10 per meal, and the 60-seat eatery is attracting as many paying diners as in the past. Here, tourists, judges, businessmen and even the mayor of Salt Lake City, Ralph Becker, dine alongside single mothers, laborers, college students and street people. Cerreta says she’s seen lasting friendships form as strangers sit down together at tables seating two to six people. When they go to the buffet counter to be served, there’s only one rule: Don’t ask for more than you can eat. Food is never wasted, because every scrap is either consumed or composted. (Meat bones are thrown in the trash only after being boiled for soup.) That’s unheard of at conventional restaurants, where diners’ leftovers are thrown away. “We have three Dumpsters outside our restaurant,” says a Salt Lake City restaurateur who manages a branch of a $28 million seafood chain (and who asked to remain anonymous). “After weekends, they are filled to the brim with garbage, at least half of which is food.” At One World Everybody Eats, on the other hand, by the end of an average night, there’s a quarter of a 10-gallon can of garbage and one or two five-gallon buckets of food scraps, which are composted at a nearby community garden that also serves as a site for educational programs. Cerreta says it’s the savings from this lack of waste that enables the restaurant to be self-sustaining. A curvy woman with luminous hazel eyes and a broad smile, Cerreta had zero experience running a restaurant when she jumped into the food business. She’d moved to Salt Lake City to open an acupuncture clinic in 1997, after studying acupuncture and herbal remedies at the International Institute of Chinese Medicine, in Santa Fe. The clinic was very successful: She saw from 20 to 25 clients a day and made good money. But, at 41, after running the business for five years, she “hit a spiritual glass ceiling,” she says. She’d come to believe that most of her patients were lonely rather than ill. “Loneliness is an undiagnosed disease in this country, and I wanted to change that,” she says. A café where customers could socialize seemed like a worthwhile enterprise. In 2002, with no idea what she was getting into, Cerreta opened a small coffee and sandwich shop in the building that housed her clinic. She called it Smoochy’s One World 7-10, envisioning it as a healthy alternative to 7-Eleven stores. She hired five people and funneled all the profits from her acupuncture practice into running the shop. Six months into the venture, however, the shop wasn’t attracting enough customers to cover costs. Realizing that she couldn’t run two businesses at the same time, she folded the clinic, let the coffee shop staff go and ran Smoochy’s herself. She opened an hour earlier than before, hoping to bring in more customers. “I hon­estly wasn’t sure what was coming next. It was like throwing myself down the Grand Canyon,” she says. For the next four months, she struggled, doing all the food preparation, shopping and cleaning. She maxed out her credit cards and could barely pay her rent. Then came the lowest point: Her car was repossessed. Concerned friends told her she was crazy to keep the shop going. Still, Cerreta was positive that food was somehow in her destiny. A few years earlier, Cerreta had learned to trust her intuition and listen to what the universe, or her own subconscious, was trying to tell her. She’d been training in martial arts and was about to take a test for her yellow belt when she had an overwhelming feeling that something would go wrong. She went ahead with the test anyway and ripped a muscle in her groin so badly that her left thigh turned black from bruising. Cerreta thought she’d be bedridden for weeks, but she promised herself that if her leg healed sooner, she’d never again ignore such a strong feeling. The leg healed in 10 days. That’s why Cerreta paid attention in June 2003 when, about a month after her experience with Doggers, she had what she describes as a Field of Dreams moment: a strong feeling that she needed to let customers pay whatever they wanted. “It was such an unusual phenomenon, and it hasn’t happened to me since,” she says, laughing at how unlikely it sounds. into a basket on the counter, smiled and left. Cerreta, not checking to see how much the woman had paid, felt a surge of recognition, thinking, oh my gosh, this is my purpose. The event marked the beginning of Cerreta’s economic turnaround. Operating a coffee shop on a pay-what-you-want basis was so unusual that people started flocking to it. Encouraged, Cerreta decided to expand beyond sandwiches and started offering one dish cooked with fresh, local produce every day. At first, the news about the restaurant spread by word of mouth, and then in September 2003 the Associated Press wrote a news story that started, “Salt Lake City’s One World Café breaks two of the most fundamental rules of the restaurant business: It has no menu and no prices.” The article was picked up by newspapers across the country and gained her both local customers and interested tourists. It took Cerreta two years to get back on her feet financially. Then, with her charitable goals of fighting hunger and educating people about waste uppermost in her mind, she sought nonprofit status, which the IRS granted in 2006. In effect, Cerreta gave the enterprise away. “It’s not mine anymore,” she says in a voice both triumphant and wistful. The nonprofit status also meant her eatery could not call itself a restaurant or café. It’s now a community kitchen, part of the One World Everybody Eats Foundation, with a board of directors that oversees operations. Cerreta is a paid employee whose job description includes doing outreach to nonprofit groups around the country, speaking about food waste and world hunger, and mentoring small business owners. The work suits her perfectly. Cerreta is enthusiastic and outgoing, but also thoughtful and patient. As part of her mission, she spent a month in Denver mentoring the founders of the nonprofit SAME Café (So All May Eat), which opened its doors in 2006; and she helped create a sister community kitchen called One World Spokane, which launched in 2008. Cerreta also advised a no-waste, pay-what-you-want commercial eatery called Potager, which opened in January 2009 in Arlington, Texas. Like-minded groups in Durham, North Carolina, and Charleston, South Carolina, are planning to open community kitchens this year. She also urges other commercial restaurant owners to reduce waste by allowing patrons to choose from small, medium and large portion sizes. While Cerreta says she makes less money now than she did when she owned her acupuncture business, she lives comfortably. Because of her travel and charitable work, people sometimes think she has a trust fund. She doesn’t. What she does have is a fulfilling and rich lifestyle. In her free time, she gardens and works on crafts projects (using donated yarn to crochet baby blankets that are sold at the kitchen). She takes long walks in the park with Gertrude, the mutt that she found starving on the streets of Bangalore, India. She lives in a modest, artsy-looking studio apartment above the restaurant, and practices yoga and meditates. She talks every day with her 84-year-old mother, who lives in Canton, Ohio. Despite Cerreta’s success with One World Everybody Eats, the nonprofit has had its share of growing pains. Last October, after a series of bookkeeping and accountability snafus plunged the organization into debt, the board of directors fired the longtime general manager, and three angry staffers staged a highly publicized walkout. 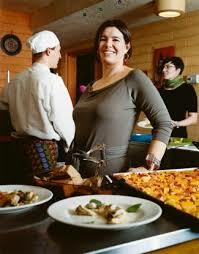 Cerreta promptly went to work in the kitchen herself until the board hired new staff. The organization is solvent once again.